Our professional roofers at Slippery Slope Roofing are available to take on your roofing project of any size in the Orillia, ON area. Homeowners throughout the country are often looking for ways to save money by taking on DIY projects that will help to increase the value of their home and provide a better living environment for themselves and their family members. While there are certainly some tasks that are easier, installing or repairing a roof isn’t one of them. 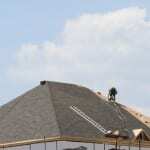 There are several reasons why it is always better to hire professional roofers. The main reason that people choose to do projects themselves is for the cost savings, but when professional roofers take on your job, it is actually more likely to cost less. Most roofing companies have connections within the industry and can purchase items in bulk, which is cheaper in the long run. Plus, if you make a mistake in your DIY job, you will still end up hiring a roofing company and potentially spend even more. Our professional roofers know the best materials to use that are durable and high quality, whereas you may not know the difference between types of shingles. This could mean that your roofing job might not last very long, which will cost you more when you have to replace it in the near future. Your home also provides protection from the elements, so our professional roofers will work efficiently to get the job done quickly. You probably don’t have a lot of time to devote to the job, which means it could take twice as long. Our professional roofers at Slippery Slope Roofing are available to take on your roofing project of any size in the Orillia, Ontario area. Contact us today to get started! At Slippery Slope Roofing, our professional roofers proudly serve Orillia, Barrie, Bradford, Alliston, Newmarket, Midhurst, Cookstown, Beeton, Innisfil, Angus, Collingwood, Wasaga Beach, Oro-Medonte, Midland, New Tecumseth, Clearview, Bradford, Essa, Stayner, Springwater, and surrounding areas of Ontario.